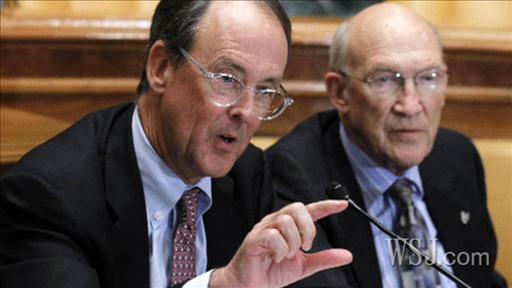 December 4th, 2010 9:46 AM by Lehel S.
The Debt Commission co-chairmen, Erskine Bowles right, and former Wyoming Sen. Alan Simpson. WASHINGTON—Seven members of the White House's deficit commission, including the chairman of the Senate Budget Committee, endorsed its final plan Wednesday, setting up the prospect of action to address the nation's fiscal woes next year. See more on the deficit-reduction commission's proposals. The full 18-member panel will vote on the proposals to cut the deficit on Friday and is expected to come up short of the 14 votes needed to issue a formal recommendation to Congress and the White House. But the show of bipartisan support, including the votes of five of the six members appointed by President Barack Obama, gives the plan momentum many thought impossible just weeks ago. Separately, Republicans and Democrats sat down Wednesday to negotiate a compromise on extending Bush-era income tax cuts. Many strategists in both parties believe the effort could be the first step toward a deal this month to temporarily extend current tax rates for all income levels. Obama administration officials said they would harvest many of the commission's ideas as the president assembles a budget plan for 2012. They pointed to cuts in defense spending, limiting tax deductions and a broad overhaul of Social Security as areas to pursue. Rep. Paul Ryan (R., Wis.), a commission member and the incoming House leadership's point man on deficit reduction, said he would use many of the commission's proposals as a starting point for a Republican plan. "There are some ideas in here that I think are worth copying, borrowing, and putting in this year's budget, which I fully intend to do," said Mr. Ryan, who will be chairman of the House Budget Committee in January. Overall, the plan would hold down the growth of the federal debt by roughly $4 trillion by 2020, or about half of the $7.7 trillion by which the debt would have otherwise grown by that year, according to commission staff. The current national debt is about $13.9 trillion. The president's bipartisan deficit reduction panel released its plan today and will take a final vote on Friday as the panel's chiefs push controversial proposals such as limiting the mortgage interest tax deduction. John McKinnon discusses. The 59-page proposal advanced by former Clinton White House Chief of Staff Erskine Bowles and former Republican Sen. Alan Simpson, has fundamentally altered the debate in Washington about deficit reduction. With the specter of Europe's debt woes looming large, lawmakers have embraced ideas on taxes and spending that many long assumed were untouchable. A White House embrace of significant parts of the report would cement Mr. Obama's tack toward the political center after Democratic losses in the midterm elections. On Monday, he angered union leaders and liberal activists by proposing a two-year salary freeze for about two million civilian federal workers. And he has signaled flexibility on the expiring tax cuts, suggesting he might support a temporary extension of upper-income breaks if middle-class tax cuts were extended permanently. For the deficit plan to progress, it must survive fierce opposition from the left and the right. Liberal groups castigated cuts to Social Security and health care. Americans for Tax Reform, which has extracted "no new taxes" pledges from most Republicans in Congress, decreed that the proposal amounted to a trillion-dollar tax increase. 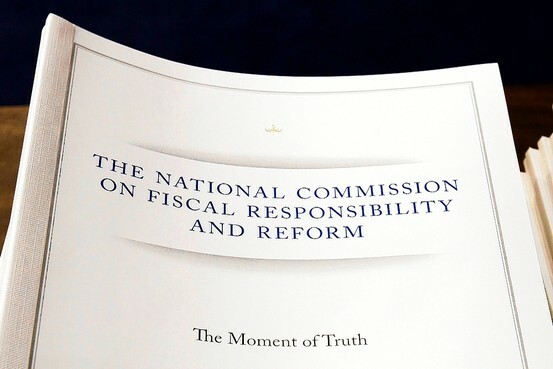 The National Commission on Fiscal Responsibility and Reform was created by the White House in February, and the co-chairmen's proposal would affect almost every American. 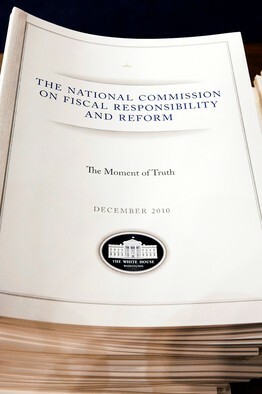 The report from Messrs. Bowles and Simpson warns that the nation has reached "the moment of truth." 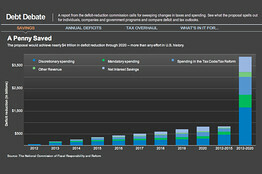 To cut the country's ballooning debt by $4 trillion through 2020, they propose upending many tax and spending policies. 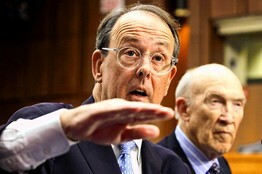 The plan advanced by commission co-chairmen Erskine Bowles, left, and Alan Simpson is altering the debate on how to reduce the deficit. The proposal would lower income tax rates but gut $1.1 trillion in cherished tax breaks—including deductions on mortgage interest—impose a gas tax, raise the retirement age for Social Security and cut Medicare and Medicaid costs. It would cut farm subsidies and spending on everything from the U.S. military to the government travel budget. "You were serious," Rep. Xavier Becerra (D., Calif.), one of the commission's undecided votes, told the co-chairmen. "You put taboos on the table." Budget experts say the country's deficits are on an unsustainable trajectory, fueled by a complicated tax code, an aging population and rising health-care costs. David Cote, chief executive of Honeywell International Inc. and a presidential appointee to the panel, said the Baby Boomer generation he is part of would "crush the system" if no changes were made to Social Security, Medicare and Medicaid. He plans to back the plan. Two sitting lawmakers, Sens. Kent Conrad (D., N.D.), chairman of the Senate budget committee, and Judd Gregg (R., N.H.), also publicly supported the plan. There are 12 lawmakers on the panel, and their support is seen as crucial because Congress will have to enact any changes. Sen. Richard Durbin (D., Ill.), another panel member, said raising the retirement age for Social Security over time "is acceptable to me," signaling a possible compromise both parties might seek on changes to that program. Another presidential appointee, former service union president Andy Stern, said he would offer his own deficit plan but said that didn't mean he would vote against the commission's version. Democratic Rep. Jan Schakowsky was the only member of the panel who said Wednesday she would vote against the proposal. She said the cuts to entitlement programs, particularly Social Security, were too severe and would punish older Americans. Mr. Ryan singled out Social Security, broadening the tax base with lower rates, and changing the budget-process rules as areas where he was particularly supportive. Whether the plan receives 14 votes may be less important than what Mr. Obama does with the report, said Rudolph G. Penner, a former GOP director of the Congressional Budget Office, now with the Urban Institute, a liberal-leaning think tank. Publicly, the White House held its distance Wednesday. Although the report is now final, White House press secretary Robert Gibbs refused to comment, saying he did not "want to pre-judge what the commission comes up with before its vote at the end of the week." Privately, administration officials said they were looking at it closely. The White House is crafting its budget for fiscal 2012, a document that will lay out Mr. Obama's legislative response to Democratic electoral losses last month and his approach to the $1.3 trillion budget deficit. With unemployment still at 9.6%, officials said the president was still not eager to cut spending quickly. But he also wants to head off bond-market jitters and satisfy political demands by setting some plan for long-term deficit reduction, aides said. White House officials said the commission has made that easier by changing the terms of the debate. Rather than talking about tax increases, they attacked "tax expenditures," a more politically palatable terminology adopted by Republicans such as Mr. Gregg. By being ambitious in areas such as the mortgage interest deduction, the commission may have given political cover for Washington to take more modest measures, such as lowering the cap on tax-deductible mortgages. The same is true of Social Security. Should Homeownership Be Part of the American Dream? One area White House officials said they refused to touch was the health-care law, after the bruising battle that led to its enactment this year. Liberal interest groups and union leaders reacted harshly to the commission's plan. "With this report the Deficit Commission once again tells working Americans to 'Drop Dead,'" said AFL-CIO President Richard Trumka. Sen. Tom Coburn (R., Okla.) and Rep. John Spratt (D., S.C.), both said they wanted more time to study the proposal, but based on the compliments they heaped on the plan it appeared they were both leaning towards supporting it by Friday. House lawmakers, meanwhile, voted to approve a measure to fund the operations of the federal government through Dec. 18, as Congress continues to wrangle over a longer term funding solution. The $50 billion bill would avert a federal government shut down at midnight on Dec. 3 when the current short-term extension of funding its operations expires.